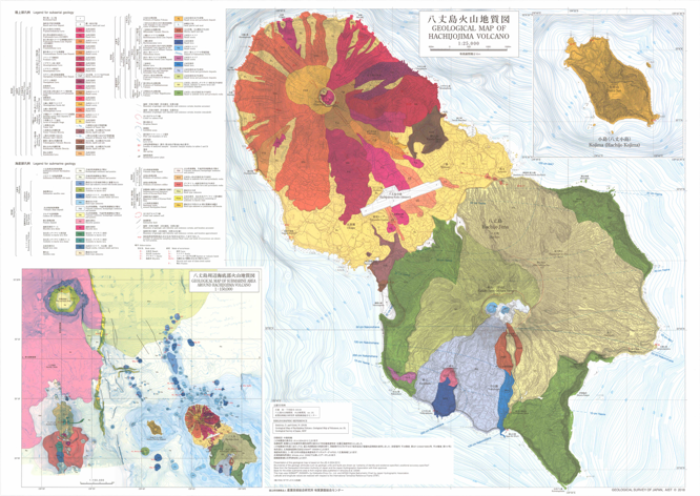 The Geological Survey of Japan (GSJ) has published the 1:25,000 Geological map of "Hachijojima Volcano", compiled by Osamu Ishizuka and Nobuo Geshi (Research Institute of Earthquake and Volcano Geology) in May 2018. This is the first 1:25,000 geological map of Hachijojima and its surrounding offshore area. Hachijojima is the second largest volcanic island among the Izu Islands, and its last volcanic eruption occurred some 400 years ago. The map has revealed the detailed history of volcanic activity of Hachijojima both on land and underwater, including the distribution of submarine volcanic centers. Especially, the little-known volcanic activity of the younger and active Nishiyama Volcano has been clarified in detail for the first time. The map is expected to be useful for long-term prediction of its volcanic activity and the development of volcanic hazard mitigation plans.